*LAS VEGAS – ATSC 3.0! All-digital HD radio! Virtualized everything! It’s NAB Show time once again out here in the desert, and we’re here for our 18th year seeing the sights and bringing you as much news as we can share. And we’re partnering with our friends at Wheatstone for live video from the show floor today and Tuesday, too – follow them on Facebook for all the details! Our news, however, starts back east in NEW YORK, where it appears Pacifica’s WBAI (99.5) has finally reached a deal that will move its transmitter from the Empire State Building, where it owed more than $1.8 million in back rent. Even for a station that’s long lived on the financial brink, the issues with Empire’s owner, the Empire State Realty Trust, have been especially dire. ESRT, of course, took Pacifica to court and won a default judgment, forcing WBAI and the national Pacifica system to either come up with the money or run the risk of having assets seized. Pacifica being Pacifica, that crisis led to plenty of internal dissent. Many of the system’s professional managers recommended selling some assets voluntarily – but that’s never been in Pacifica’s DNA, which led a rival faction to push instead to take out a loan. Pacifica’s most recent chief financial officer exited in March over the dispute (and the lack of budget to prepare for a long-overdue audit); in the end, the loan faction won, albeit with another big victory along the way. That came with the help of Marc Hand and the Public Radio Company, which negotiated the settlement deal Pacifica and ESRT announced on Thursday. Under the deal, Empire will accept an undisclosed amount to drop its claim against WBAI, it will allow the station to exit its lease contract two years ahead of schedule, and Pacifica will pay off the amount via its new loan, on which it will make no payments for 18 months and then pay only interest for the next 18 months. So where does WBAI go now? *We start our column this week with a sad ending to a gripping story from MAINE, where WCSH (Channel 6) meteorologist Tom Johnston never returned from a trip he took a week ago to an appearance at the Sunday River ski resort in Newry. After Johnston met with fans at the Springfest event on April 1, he didn’t return to his home in Old Orchard Beach, where his girlfriend reported him missing on Monday. That touched off a search that ended Thursday night, when Johnston’s car was found empty on the side of a road in Auburn. Auburn police say Johnston appears to have walked off alone into the woods, where they think he took his life. Johnston’s disappearance, and then the news of his death, prompted an outpouring of emotion from co-workers and viewers. The Rutgers University graduate had been with WCSH and Bangor sister station WLBZ since 2014, when he moved back north after stints in Fort Myers and Jacksonville, Florida. Known as “TJ Thunder,” Johnston was the weekday 5, 5:30 and 6 PM weatherman on WCSH/WLBZ. He was just 49. *Drivers on the Thruway south of Albany are plenty familiar with the three-tower site of Albany Broadcasting’s WROW (590), which sits on a big piece of land on the east side of the highway in Glenmont. In addition to hosting the 5000-watt signal of “Magic 590,” the land could soon have another use: the Times Union reports Albany Broadcasting has applied to the town of Bethlehem to put a solar farm around the tower bases. The 2.6-megawatt project would be built by Pennsylvania-based Dynamic Energy, and would provide more than enough power not just to run WROW’s transmitter but also to sell back to the power company under net metering. Could it set a trend for AM owners sitting on large plots of land? Perhaps – but many engineers are also wondering how the solar panels would affect WROW’s ground plane and directional pattern, too. *A pair of station sales in PENNSYLVANIA include Bob Stevens’ addition of two more signals to his cluster south and east of Pittsburgh. Stanley Wall’s widow Sharon is selling WLSW (103.9 Scottdale, seen at left in a 2004 Site of the Week visit) and AM simulcast WQTW (1570 Latrobe) to Stevens’ Broadcast Communications III, Inc. for $605,000. * The latest format flip in MASSACHUSETTS is more than just your average format flip. When Codcomm debuted top-40 “Y101” on WHYA (101.1 Mashpee) at 11 AM on Thursday, it marked the return of some of the format’s top practitioners. Codcomm, of course, is owned by John Garabedian, who’s been doing top-40 since the 1960s as PD of Boston’s WMEX (1510, now WUFC), founder of influential video channel WVJV (V66) and as the creator and longtime host of the syndicated “Open House Party.” So when he bought the former Nassau stations on Cape Cod last year and set the ball rolling to split the “Frank” simulcast between WFRQ (93.5 Harwich Port) and then-WFQR (101.1), it seemed very likely that he’d be the man to bring the hits back to the market after the demise of the last top-40 on the Cape, the former WRZE (96.3, now sports WEII). And then Garabedian began assembling a staff that included station manager Steve McVie, who’s been “the man” for top-40 on the Cape for years, right back to the day four years ago when he was the last voice heard on WRZE. It all amounted to one of the worst-kept secrets in radio for a few weeks running, culminating last Monday night in the end of the “Frank” simulcast on 101.1 and the start of two and a half days of a computerized countdown interspersed with speech-synthesized snark. “Party Rock Anthem” kicked off the real format on Thursday morning, and it comes with an airstaff already in place. Jessica (late of WXLO in Worcester) handles middays, McVie is doing afternoons, Jackson Blue (tracked from WXKS-FM in Boston) handles nights, and mornings are the province of the syndicated Elvis Duran show from New York’s Z100. 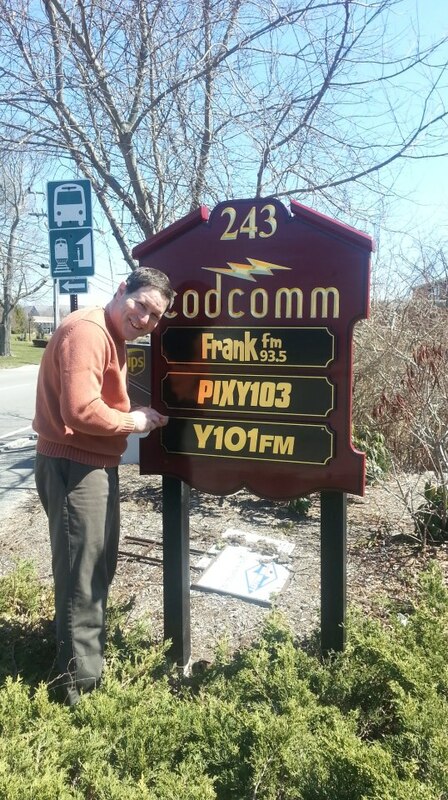 Now Garabedian and McVie and the staff at Codcomm can get busy preparing for the fourth signal in their cluster: WKFY (98.7 East Harwich) is currently a construction permit, and when it hits the air, it appears they’ll need a new sign outside the company’s Hyannis studios. *Our PENNSYLVANIA news starts at Radio One in Philadelphia, where “Old School 100.3” launched on schedule Tuesday at WRNB (100.3 Media). For now, the new format is running jockless, but the syndicated Tom Joyner morning show and local airstaff are expected to be back on the air fairly soon. Down the hall at WPHI (Hot 107.9), there’s a new morning show: Shamara Alfa, late of Beasley’s WRDW-FM (Wired 96.5) and Lalya St. Clair team up as “PMS: Philly’s Morning Show,” taking over from the syndicated Ricky Smiley. *If you still believe there’s such a thing as a safe job in broadcasting these days, we’d sure like to know about it. The latest evidence that times are hard – not that we really needed any further evidence – comes from CBS’ local television stations, which went through a painful round of staffing cuts last week everywhere from Los Angeles to Boston. The cuts were especially severe at Boston’s WBZ-TV (Channel 4)/WSBK (Channel 38), where initial reports indicated that as many as 30 staffers lost their jobs. We still haven’t been able to confirm that number (and the company’s not saying), but there’s no question there were significant cutbacks on the TV side at Soldiers Field Road. The most prominent cutbacks involve three veteran on-air personalities: sports director Bob Lobel, arts correspondent Joyce Kulhawik and sportscaster-turned-news anchor Scott Wahle. Lobel has been with WBZ since 1979, Kulhawik since 1981 and Wahle since 1989, most recently as co-anchor of the 9 PM newscast on WSBK. The station isn’t saying how much longer any of the departing air talent will remain, but it sounds as though they’ll be gradually eased out as their contracts are bought out, with Steve Burton likely to replace Lobel as sports director. Behind the scenes, many of the dismissed employees didn’t get the same luxury, with some being escorted out the door as soon as the news was announced. The list of job cuts included veteran engineer Fred Boudreau, commercial producer Roger Lyons, writer Casey Sherman and managing editor David Kaplar. *In other news, Clear Channel has flipped its Worcester translator, W235AV (94.9 Tatnuck) from relaying WJMN (94.5 Boston) to relaying WTAG (580 Worcester). The move gives WTAG some new coverage at night. The promised WGGB-produced 10 PM newscast won’t debut until the middle of this month, but there is some new-to-the-market programming on Fox 6 – it’s also a secondary My Network TV affiliate, carrying My programming from 11:30 PM-1:30 AM weeknights. A former WAXQ (104.3) morning host who made a brief splash in the market a decade ago has died. Darian O’Toole (real name Karen Begin) came to the US from Nova Scotia, working first in Atlantic City and then at WMMR in Philadelphia before heading west to San Francisco, where she spent most of her radio career. In late 1997, fresh off a format change that ended her run in morning drive at KBGG-FM (98.1) in San Francisco, O’Toole came to Q104 for what proved to be an unsuccessful stint in morning drive that lasted only nine months. O’Toole eventually returned to San Francisco, where she was last heard on “Free FM” KIFR (106.9). In recent years, O’Toole had been struggling with health problems. She died last Monday (March 31) of complications from a broken leg, at the age of 40. The fallout continues from the April Fools stunt in which WAAF (107.3 Worcester-Boston) afternoon jocks Opie and Anthony announced the “death” of Boston mayor Tom Menino. If the station’s goal was to get publicity, WAAF succeeded — there have been articles in the Boston papers almost every day since the stunt — but at a price. The mayor was not amused by WAAF’s offer to put the jocks in a gallows on City Hall Plaza so Menino could throw pies at them. Instead, an angry mayor reportedly faxed a letter to the FCC on city letterhead, asking the commission to investigate the incident. The letter comes at a very bad time for WAAF owner American Radio Systems, which just last week received Justice Department approval to sell its stations to CBS (although WAAF is one of several stations that must then be spun off). It’s now up to the FCC to approve the sale, and an angry mayor can’t help matters much. This week, ARS fired Opie and Anthony, suspended WAAF general manager Bruce Mittman for a month, and placed program director Dave Douglas on a one-month suspension. No permanent replacement has been named for the PM drive slot. Elsewhere in MASSACHUSETTS, commercial digital TV came one step closer this week, as WHDH-TV (Channel 7) applied for a license for WHDH-DT on Channel 42. Channel 7’s longstanding refusal to lease space on its Newton tower is finally paying off; it’s one of the few major-market TV stations that won’t have to make expensive modifications to its tower, evict other tower occupants, or build a new tower to accomodate the weight of a DTV antenna. Could one of the oldest construction permits in the northeast finally be coming to the air? NERW notes that WEIB (106.3) in Northampton has applied for a license to cover…and we hope to hear soon from our Western Massachusetts readers about the status of 106.3. That frequency’s been in FCC limbo for literally decades. MyRI is on 12.2 WPRI now, no longer on WNAC 64.2 (Which is now CW Providence). Near me in the town of Waterbury Connecticut their local radio station then called WWCO change format I don’t know what to call it is now because they it’s in Spanish it’s on 1240 on the dial. This changed happened back in February I notified radio locator about this change but they have yet changed their information on the station. It’s the second time the WCCM calls have been on 1490 in Haverhill. First time was years ago, if I recall correctly, it was when 800 changed to the Power 800 Spanish format and the talk format and calls went to 1490. The WCCM calls and talk format also spent some time on 1110 in Salem NH.